Chief Minister Jayalalithaa in 2011, announced the State government's financial assistance to Christians to take pilgrimage to Jerusalem. “In the first phase, 500 Christians belonging to all denominations would get the assistance,” she said while participating in Christmas celebrations organised by her in Chennai. Recalling her promise made by her last year in this regard while participating in the celebrations in Arumanai in Kanyakumari district, Ms Jayalalithaa said she would also consider other demands of the community. While seeking support for her government in its effort to spearhead a revolution in agriculture and industry and make the State self-sufficient in electricity production, she made an appeal for upholding the principles of love and sacrifice, giving up vendetta and selfishness. Ms. Jayalalithaa said she really enjoyed the Christmas celebration, especially carol singing by students of Sacred Heart Matriculation School, Church Park, her alma mater. “It reminded me the days when I was a student. On many occasions, I also, like the girls, had stood on a platform and had sung carols,” she added. 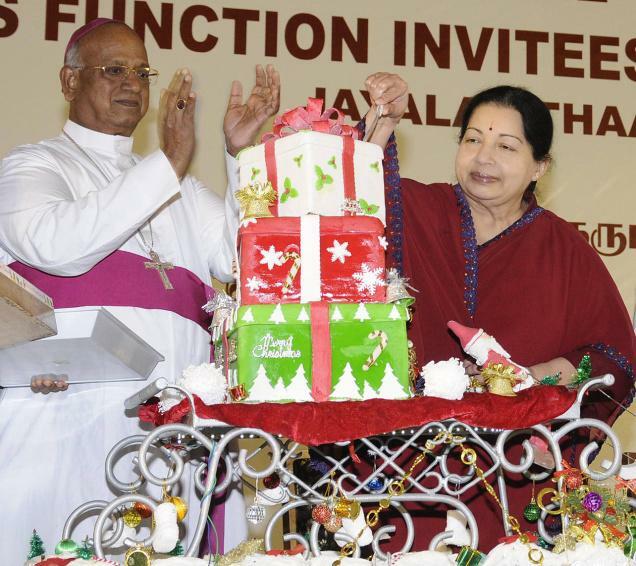 Ms. Jayalalithaa cut the Christmas cake and Archbishop of Madras-Mylapore diocese A.M. Chinnappa fed her with the first piece. Both the Chief Minister and the Bishop re-enacted the scene on a request from the photographers. “Thanks to photographers I got the opportunity to be fed by the Bishop twice,” she said. The Archbishop also expressed support for good governance and good schemes of Ms. Jayalalithaa. Church of South India (CSI) Diocese of Madras Bishop V. Devasahayam said the spirit of Christmas was reflected in all the efforts taken by the Chief Minister in the interest of the State. Minorities Welfare Department) or his nominee. providing financial assistance for the implementation of the scheme. (vi) Several other places connected with Christian faith etc. any International disputes arising, some of the places may be dropped. The Tour period will be from 7 to 10 days. (TAMCO) will be the implementing agency for this scheme. applications from the eligible Christian Pilgrims in Tamil Nadu. from among the Travel Agents in Chennai. the funds to the Tour Operator after satisfactory completion of Tour. the tneb online payment is highly fastest site to pay the current bills. church mortgage for church foundationis a offered scheme by church loans lenders. A complete church lenders directory is very helpful in this case for help to find a right financier for you. They claim, or at least intimate,https://mailchi.mp/cc08635ff53e/solopreneursguide that they can make our money grow by more than if we just shoved it into a long-term, high-interest bank account.